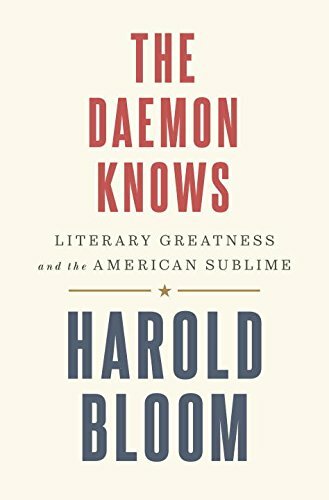 Mesmerizing and at times mesmerizingly confusing, Harold Bloom’s new opus, The Daemon Knows: Literary Greatness and the American Sublime, is (but only fractionally) this: A mix of the tenderly personal and the academically arcane, reports on conversations with well-read friends, unabashed declarations of passion and disapproval, musings on students, on teachings, on the reading life. Their receptivity to daemonic influx. The reader stops. Ponders. The man holds canons in his head. He terrifies and delights. He keeps his readers on alert for all the sideways material that flies in during discussions of Hawthone’s “The Marble Faun,” say, or Faulkner’s As I Lay Dying or Robert Frost’s “Directive.” One tries to keep track and then one stops trying. The key, it seems, is to enjoy what is directly on the page, the immediate page, and to stop trying to work it all back toward some overarching method or design. To delight in the cursives of Bloom’s mind—one thought sparking another, one line of Eliot unleashing a line of Stevens, one remembered conversation with an old friend reminding Bloom of a debate he might still have.